Frozen shoulder, also known as adhesive capsulitis, is a condition characterized by stiffness and pain in your shoulder joint. Signs and symptoms typically begin gradually, worsen over time and then resolve, usually within one to three years. Your risk of developing frozen shoulder increases if you’re recovering from a medical condition or procedure that prevents you from moving your arm — such as a stroke or a mastectomy. 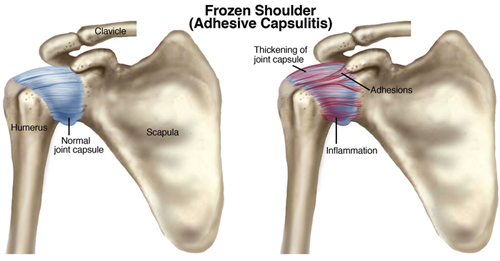 Treatment for frozen shoulder involves range-of-motion exercises and, sometimes, corticosteroids and numbing medications injected into the joint capsule. In a small percentage of cases, arthroscopic surgery may be indicated to loosen the joint capsule so that it can move more freely. It’s unusual for frozen shoulder to recur in the same shoulder, but some people can develop it in the opposite shoulder.